Westwood Residences – demolition of existing buildings at Westwood Campus and redevelopment for up to 1,000 new student residences and new academic facility. Pedestrian/Cycle Link – a new route from Academic Square, through the Science Park, to Kirby Corner Road, involving the demolition of two University owned residential properties. Degree Apprenticeship Centre Phase 2 – a further building on the central campus to allow for expansion of the imminent first phase, off the Academic Loop Road. New Academic Building – a new building on land to the rear of Car Park 15 which is currently the construction compound for the new National Automotive Innovation Centre (NAIC). New Academic Building(s) - demolition of the Humanities building on University Road and redevelopment for new academic buildings. Faculty Of Arts – demolition of Car Park 7 and redevelopment for new Faculty of Arts building. Interdisciplinary Biomedical Research Building (IBRB) – a new academic building to the north-west of the Gibbet Hill Campus. 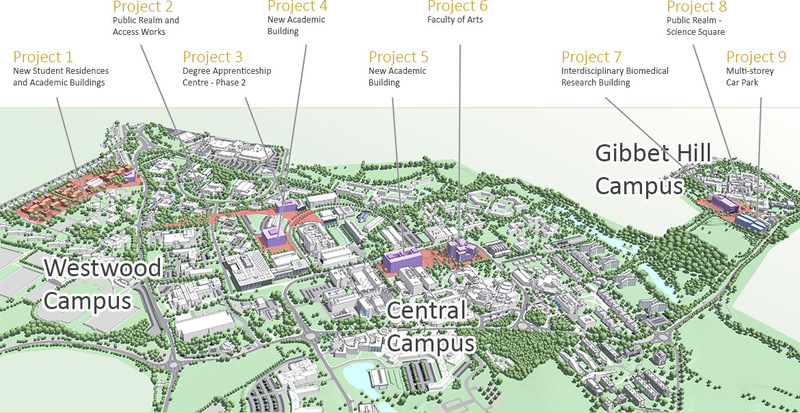 Public square – creation of a new link between IBRB, and the existing Life Sciences and Medical School at Gibbet Hill. Multi-Storey Car Park - demolition of the existing decked car park and replacement with a new Multi-Storey Car Park at Gibbet Hill.